Not having read Mayes, ‘Under the Tuscan Sun’, I had no expectations from this book, apart from the fact that TGND loved it, which itself was good enough for me. I wanted to read ‘Under the Tuscan Sun’ first, but am still on the waiting list, so decided to go with this one first. 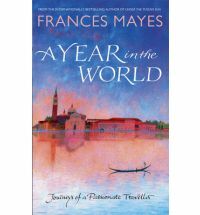 Frances Mayes goes around the world, well, not exactly the whole world, Western Europe, to be more accurate. She and her husband Ed, travel to Spain, Portugal, France, South of Italy, took a cruise on the Aegean Sea, touched North Africa, visited England and Scotland, chronicling their journeys with vivid descriptions of the places, the people, and most importantly the cuisines. Reading it was a wonderful experience. It took me a longer than usual time to finish this book, because I kept going back and re-reading passages. It made me yearn to go to all those places and live like they did. Rent a house, buy at the local supermarket – which incidently, I always wish for when I am on holiday. Somehow, I always feel like that – that grocery shopping in a place, makes you feel at home. Even in India, when on holiday, I wish I had a kitchen all to myself and could shop and cook- and this coming from someone who normally does not like to cook, is a big thing. They got invited into kitchens of restaurants, got themselves cooking lessons, rented houses on the internet, only to be thoroughly disappointed when they got to see them- at times. And at other times, loved the accommodation to bits. I loved the way she picked up interesting things like vintage baby clothes for her grandson. I was especially chuffed to read about her visiting some of the places that I had been to and loved. Her descriptions of food, were just fabulous! I found myself wishing that I had it in me to try things out of my comfort zone. While it was a wonderful book in many ways, I did feel that she was a trifle too judgemental about tourists, especially those on the free cruise that she went on, for instance. It was a little off-putting at times. Despite that, I would still re-read it. It is a very interesting and captivating read. 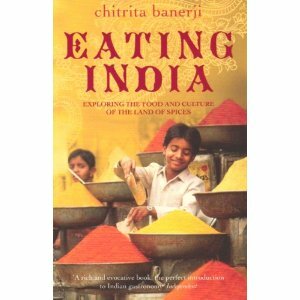 I would certainly recommend it to people who like to travel(and try local food), but it is a rather verbose book, so it might put off some.